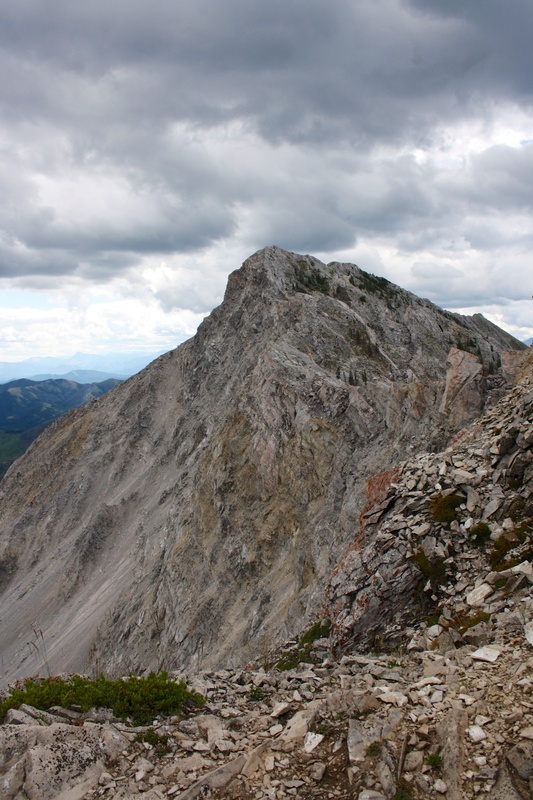 A view of Turtle Mountain from the Piitaistakis Eagle Watch site in 2012. 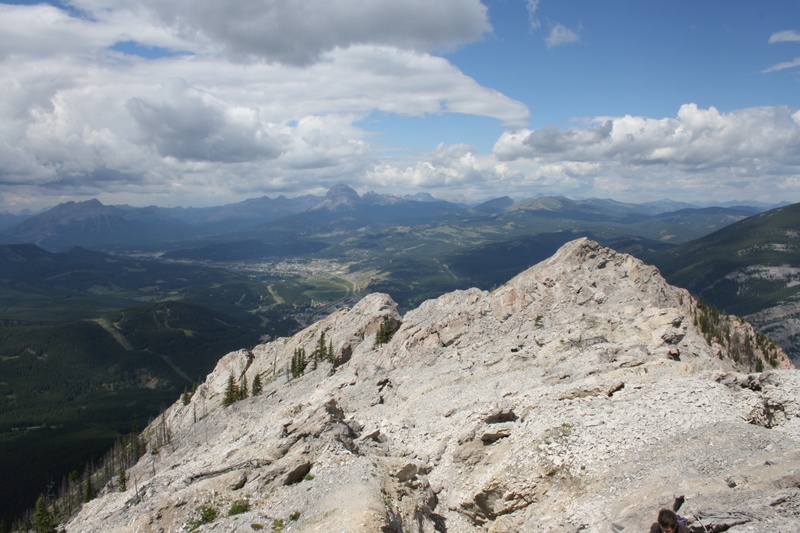 Outside of Crowsnest Mountain, Turtle Mountain is perhaps the most recognizable landmark in the Crowsnest Pass. On 29 April 1903, a section of the east face of Turtle Mountain collapsed and buried half of the town of Frank, killing between 76 and 90 people. 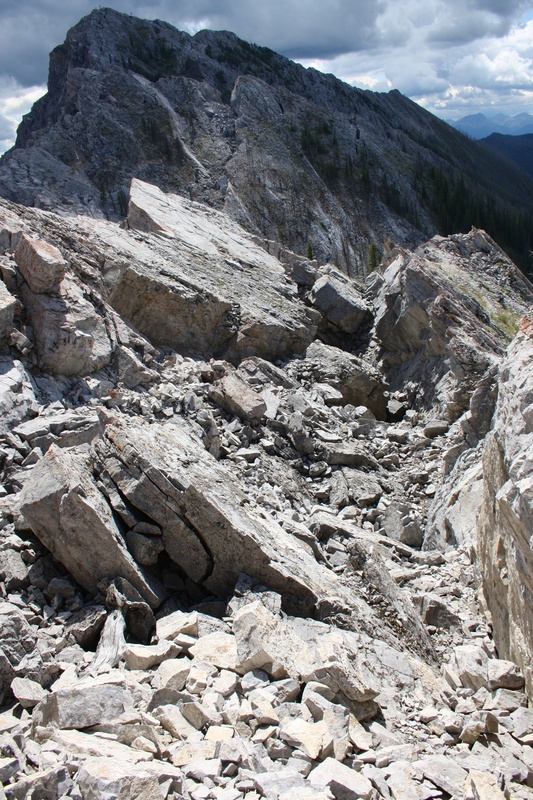 The debris field was immense as 90 million tons of limestone rocketed down the mountainside, and boulders bigger than houses were strewn across the landscape. 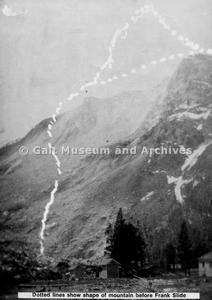 The above photo from 1903 (courtesy of the Galt Museum in Lethbridge) shows Turtle Mountain shortly after its collapse, including an outline of the mountain’s original shape. 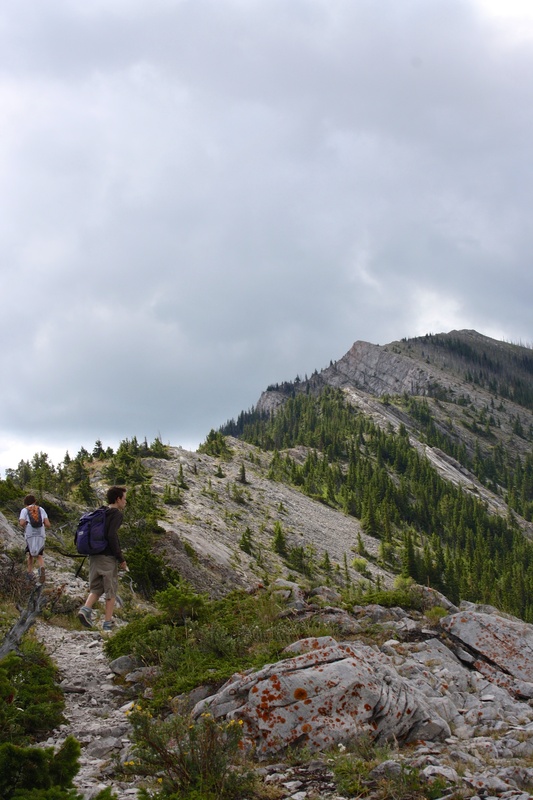 Turtle Mountain is a popular hike among locals and tourists alike with the option to summit the false summit and turn back, or to scramble across the gap where the original peak once stood, and climb up to what is now the true summit. This was my second attempt at Turtle Mountain. 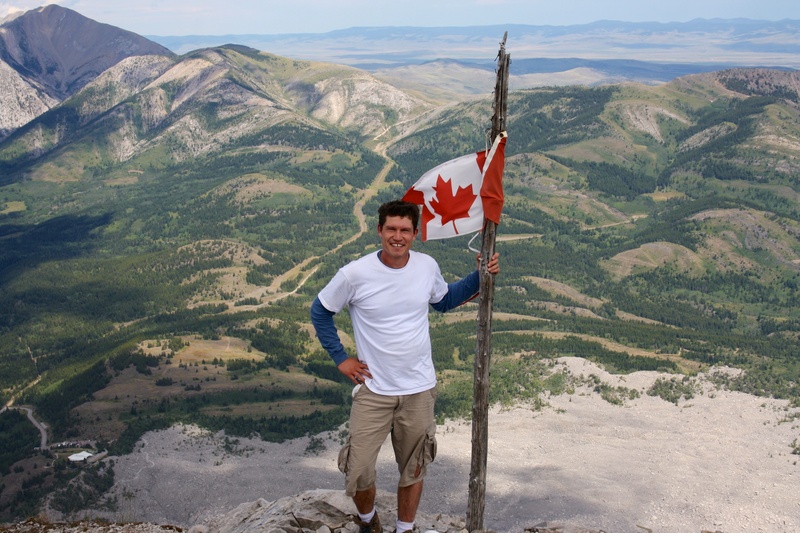 In 2003, a group of University of Lethbridge students and myself attempted to summit Turtle Mountain via the south slopes. However, intense rain and snow forced us to turn back, and ever since, I’d wanted to try it again. 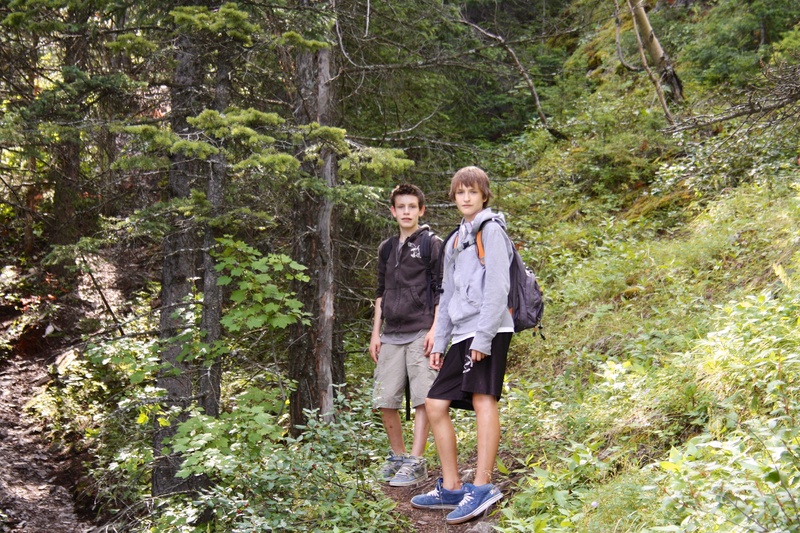 When my oldset son Joel was 15, and my other son Nathan was 13, I decided that it was time for them to summit their first mountain and Turtle seemed like the perfect choice. 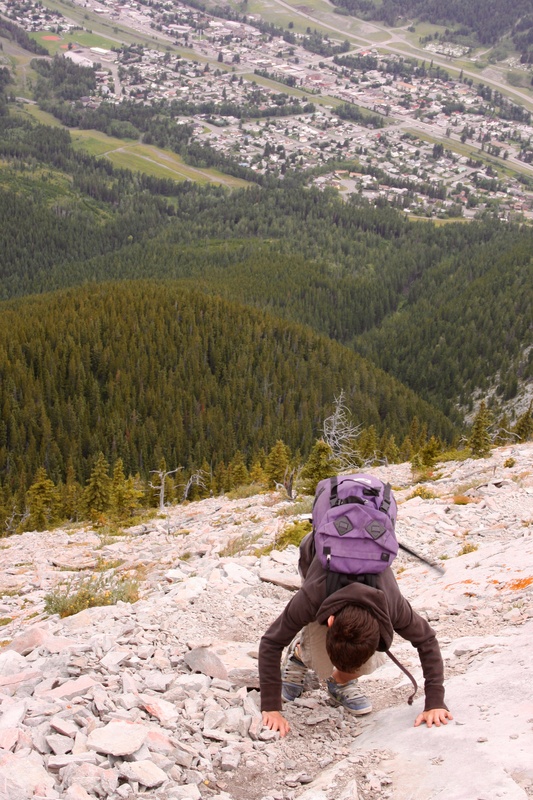 Since then, they have climbed other mountains with me and in 2012, my youngest child, Janelle, summited Coffin Mountain when she was 13 – so I guess scrambling has become somewhat of a right of passage in our family. This hike up Turtle also marked what I call my ‘scrambling rebirth’ as it sparked a renewed passion for summiting mountains that has only grown in intensity. 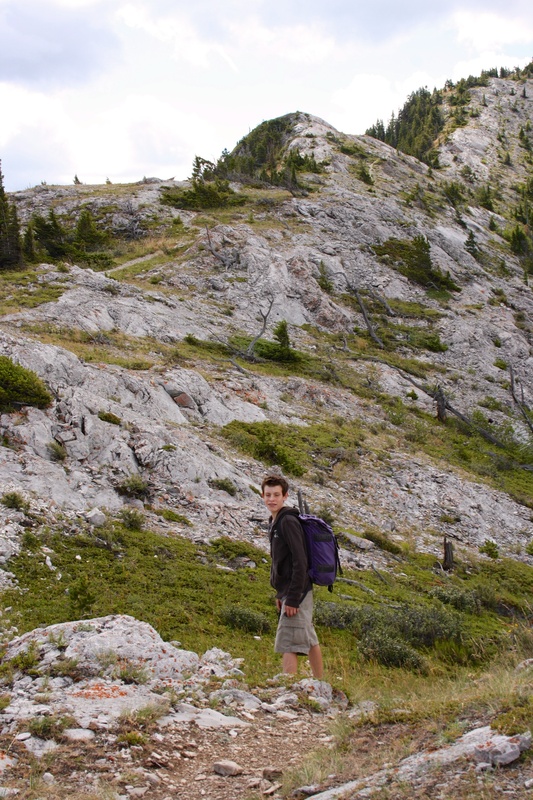 Unlike my 2003 attempt, Joel, Nathan, and I, went up the most common route which begins on the outskirts of Blairmore and follows the north ridge (right side of picture). The false summit is on the right and the true summit is on the left. The extent of the debris field is both vast and obvious. 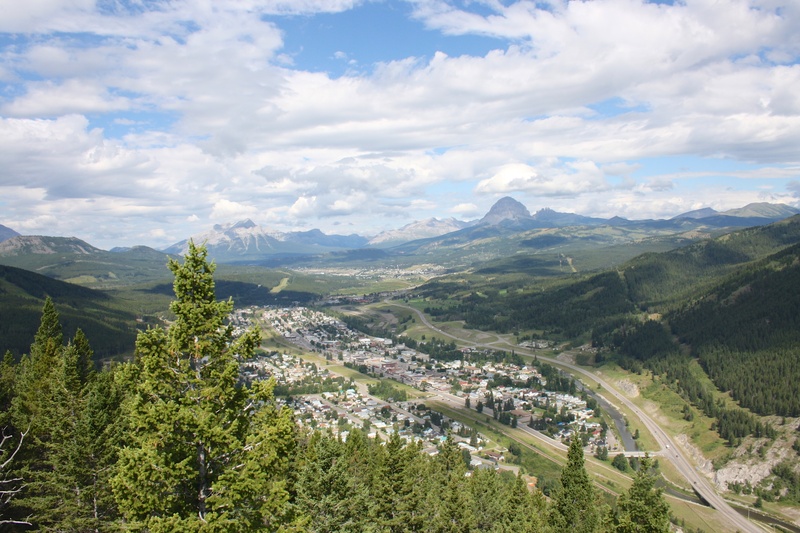 Looking down at the town of Blairmore as the views begin to open up. 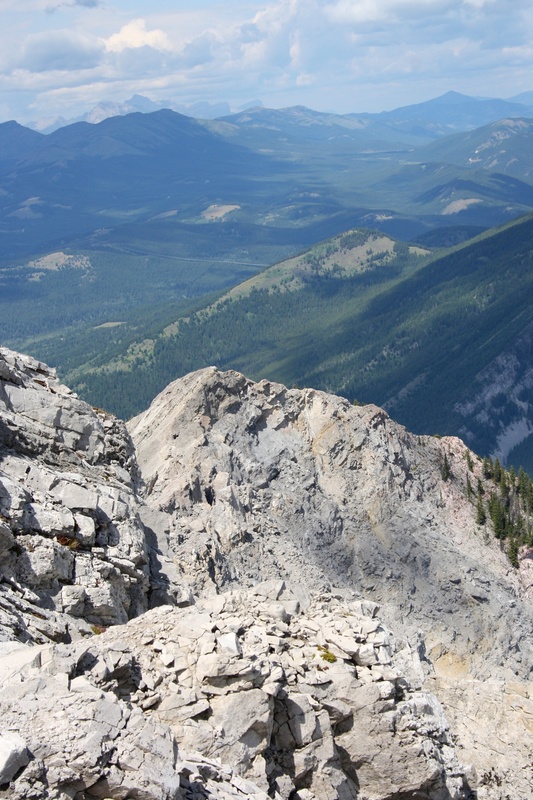 Phillipps Peak and Mount Tecumseh are in the distance on the left and “Deadman Peak”, Crowsnest Mountain, Wedge Mountain, and Saskatoon Mountain are in the centre. 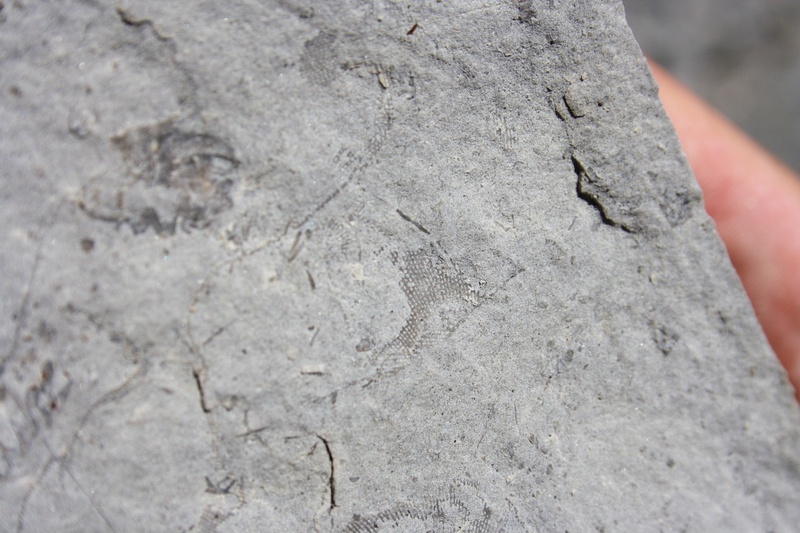 Ma Butte and McGillivray Ridge are visible on the right and The Saddle is on the far left. Joel follows a path along the ridge as we begin to move out from the trees and onto more open slopes. A picture of Nathan as we stop for a water break. 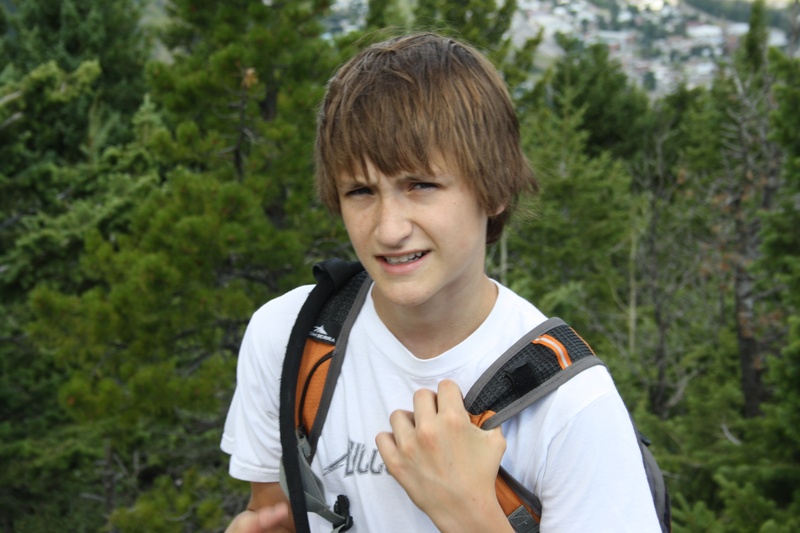 This may have been the moment in his young life when he began to truly question my sanity for making him climb a mountain. 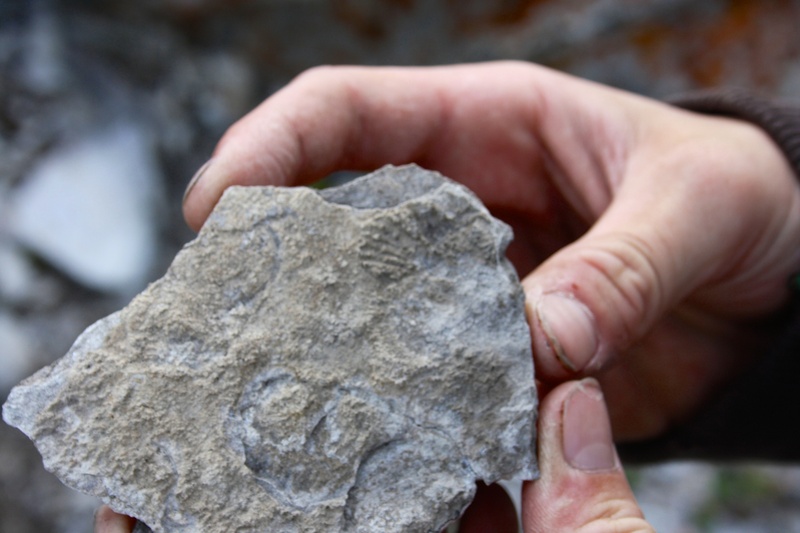 The first of a multitude of fossils that Joel found on the slopes of Turtle Mountain. Looking ahead to the false summit. 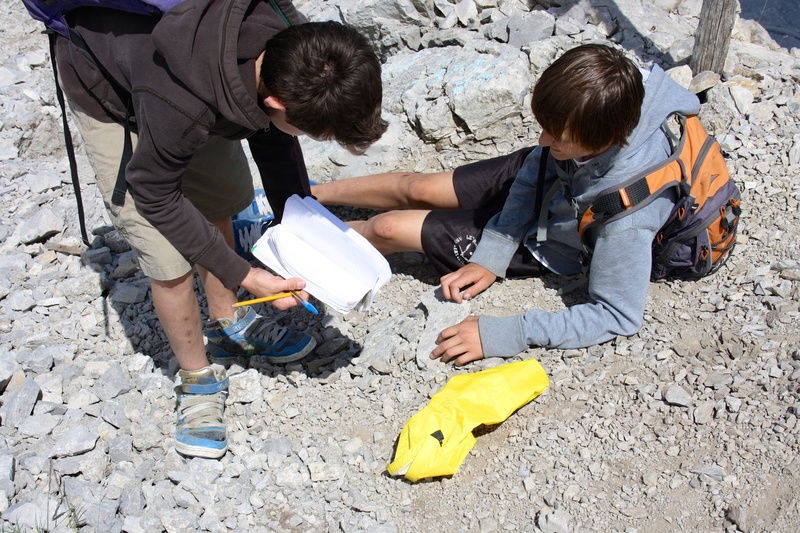 Joel and Nathan follow the trail toward the false summit. 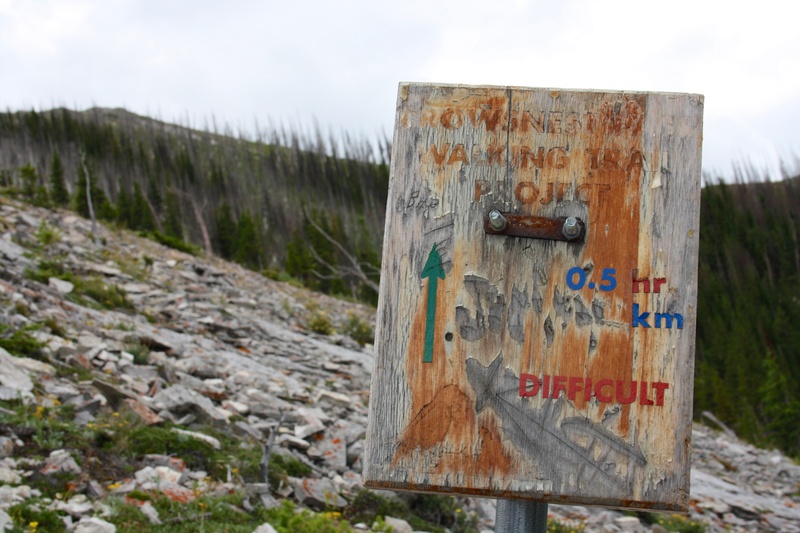 A dilapitated sign (and a well worn path) marks the route. Joel scrambles up toward the false summit. The town of Blairmore is in the background. Looking over to the true summit from the false summit. 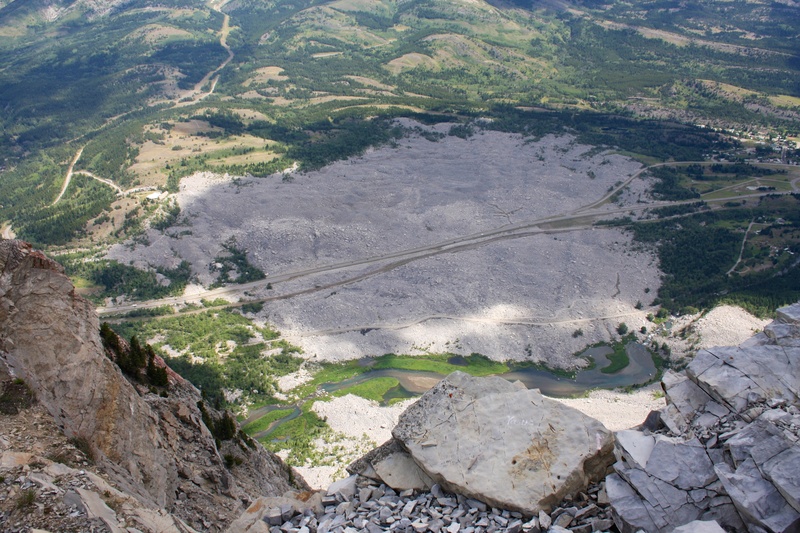 Standing on the false summit looking down at the Frank Slide. 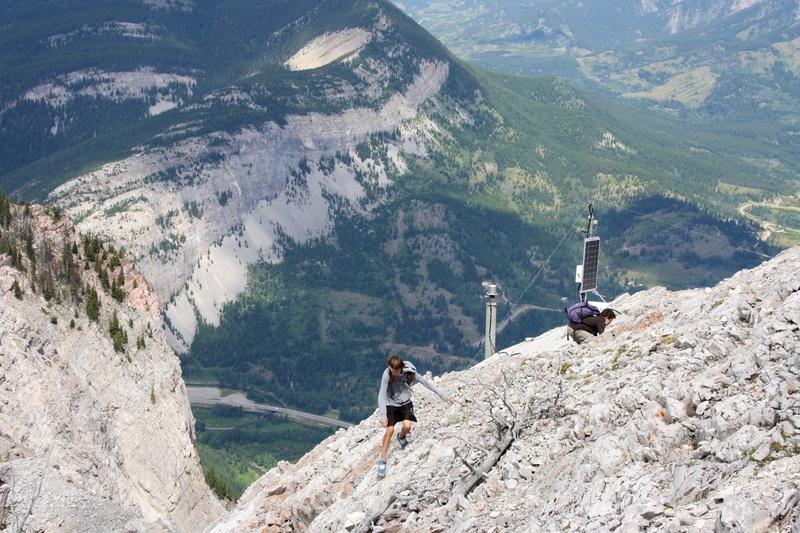 After leaving the false summit, we descended to the col – which is where the original peak once stood. Typical terrain on the col between the peaks. 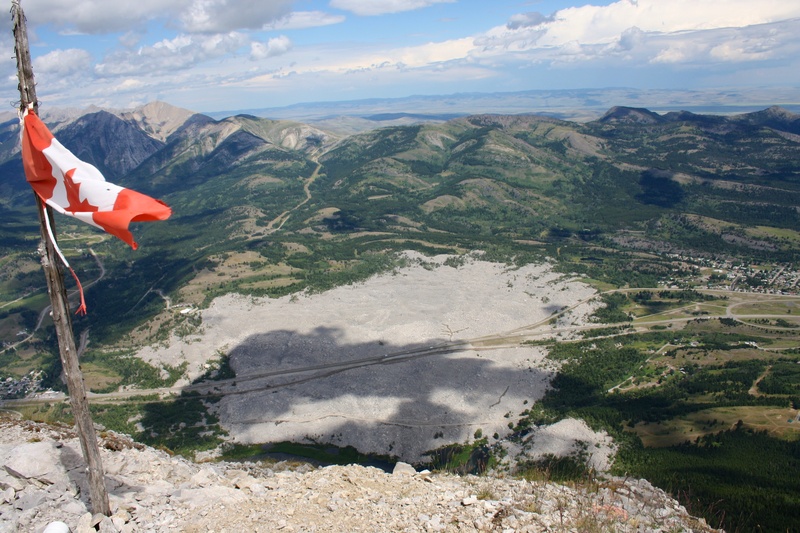 Standing directly above the Frank Slide. All of the debris below us was once where we were standing. Highway 3 and the railroad bisect the avalanche field. 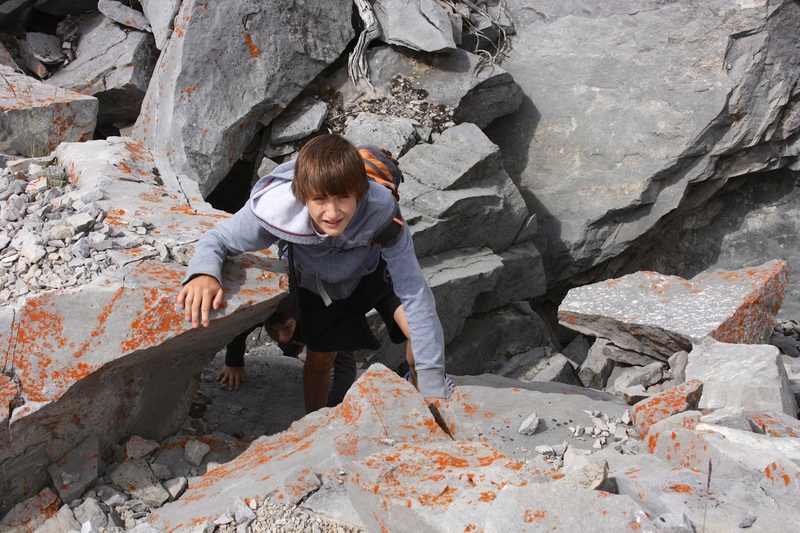 Nathan and Joel scramble through a rock tunnel. 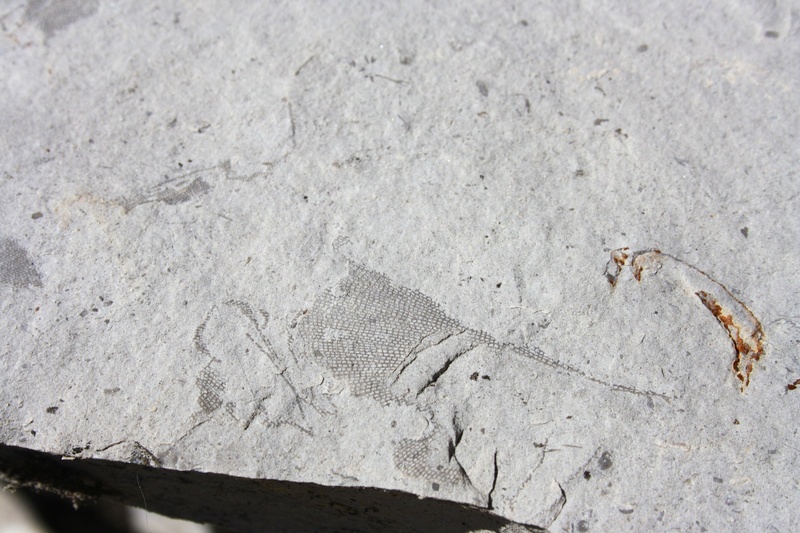 More fossils discovered by Joel. 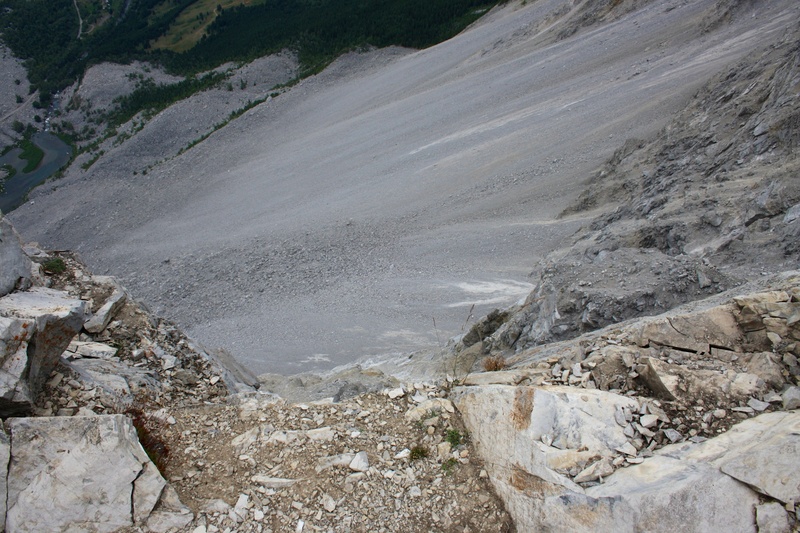 A view of the route to the summit. Some dark clouds began to roll in making for a cool atmospheric. 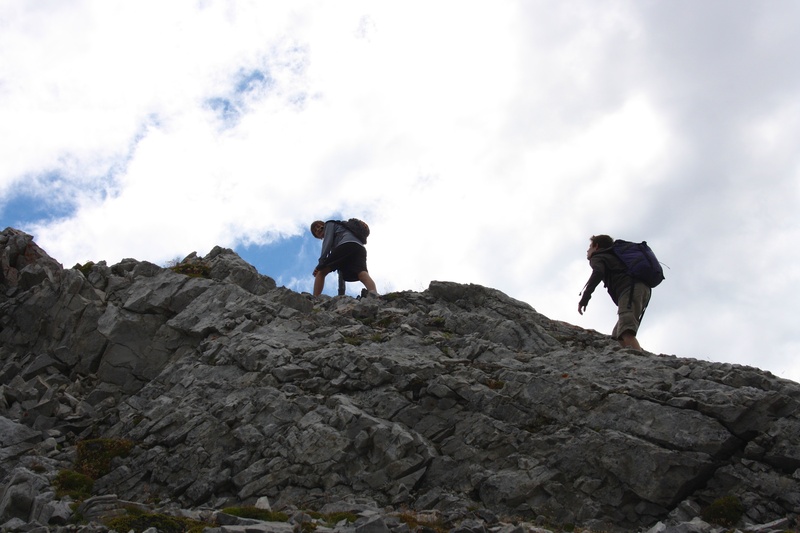 Joel and Nathan scramble toward the summit. Looking back from the slopes of the true summit toward the false summit. 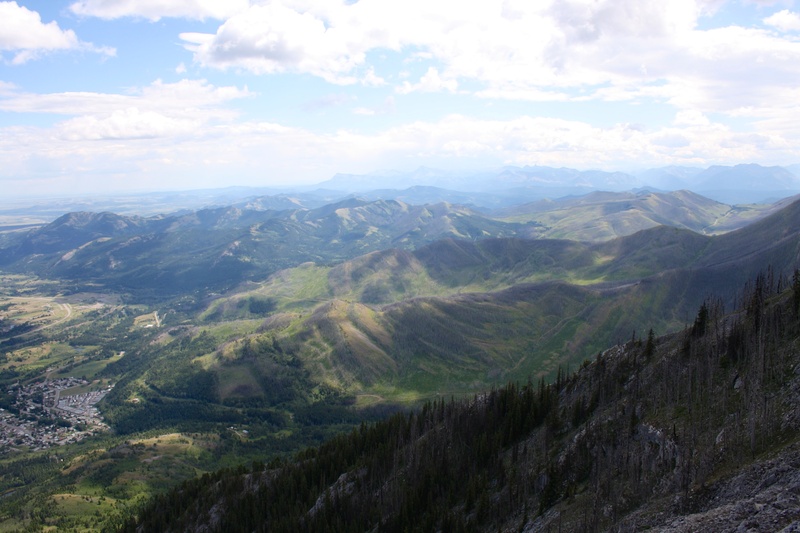 Phillipps Peak, Mount Tecumseh and Mount Erickson (barely visible) are on the left. 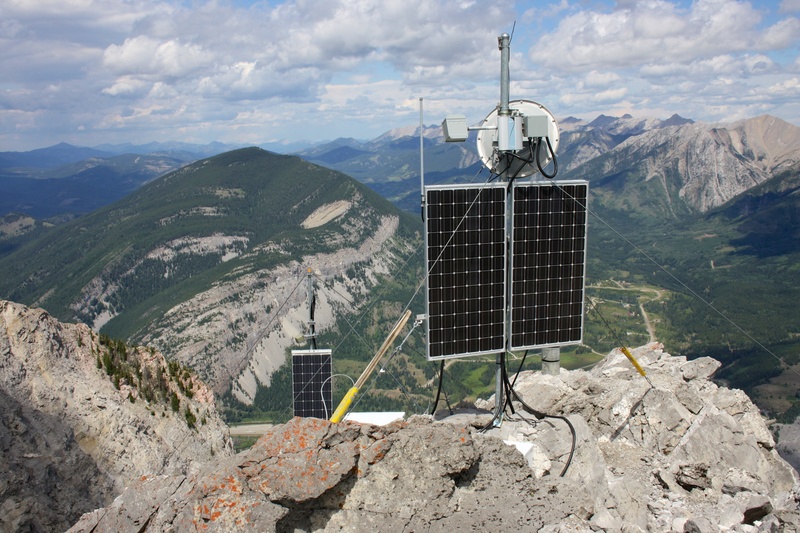 Crowsnest Mountain, the Seven Sisters, Wedge Mountain, Mount Ward, Racehorse Mountain, Ma Butte, and McGillivray Ridge are all visible. 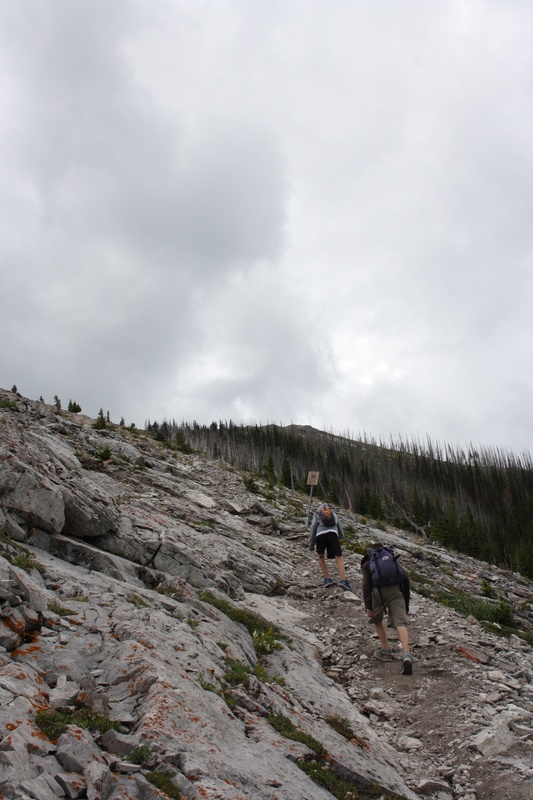 Joel and Nathan scramble along toward Turtle’s summit. 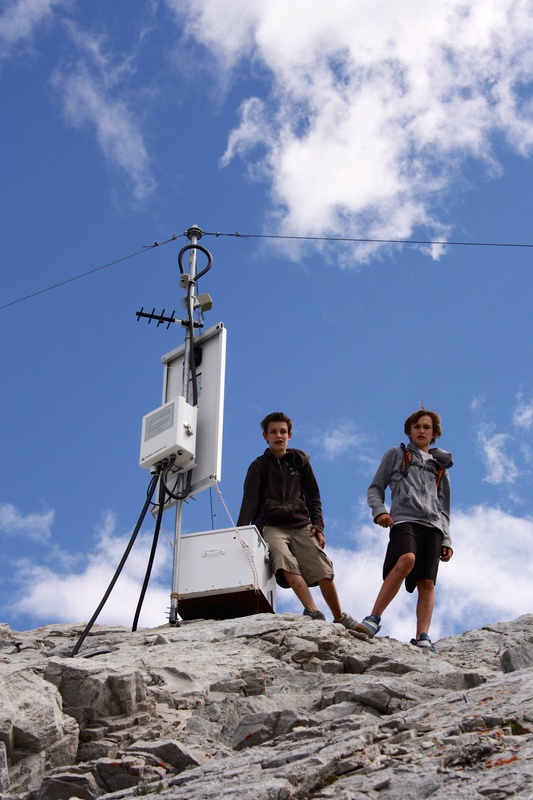 Turtle Mountain may be one of the most monitored mountains in the world. 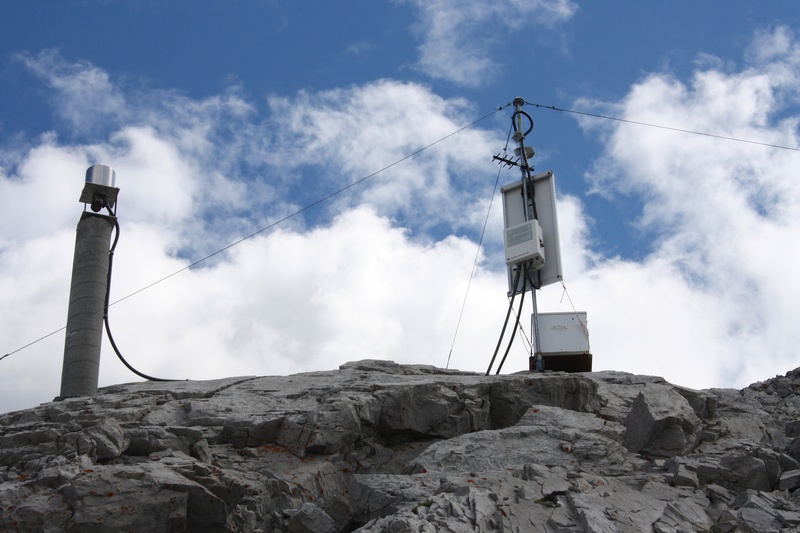 There are millions of dollars worth of scientific equipment on the mountain which track any movements the mountain might make. It is speculated that another portion of the mountain could come down in the future. What is fascinating, is that the First Nations would not camp near the mountain because they called it, ‘the mountain that moved’. As it turned out, their connection with nature proved to be true. Looking east off of the summit of Turtle Mountain. Tallon Peak is on the far right, Robertson Peak is the flat topped mountain right of centre, and the Piitaistakis Eagle Watch Site is in the centre. The South Peak of the Livingstone Range, Morin Peak, and “The Dog” are on the far left. Joel and Nathan sign the register. Standing on the summit of Turtle Mountain. The South Peak of the Livingstone Range is in the background on the left and “The Dog” is directly behind me. Looking north toward the heavily treed, Bluff Mountain. Morin Peak is on the right. Looking toward the southeast. Burmis Mountain is on the far left and Byron Hill is in the centre. In the far distance, Prairie Bluff Mountain and Victoria Peak can be seen. Table Mountain, Whistler Mountain, and Southfork Mountain (far right) are also somewhat visible. Heading back toward the false summit and home. 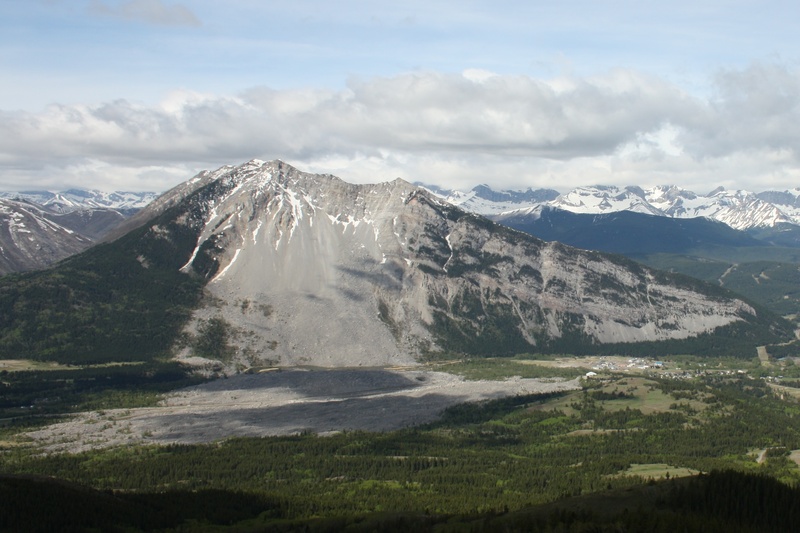 Ma Butte and McGillivray Ridge are on the left and Greenhill Ridge is in the foreground on the right. 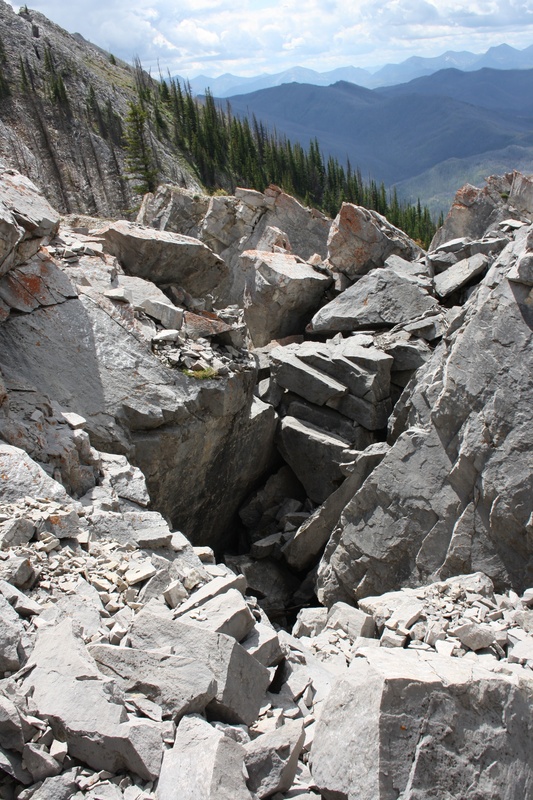 One of many large fissures on Turtle Mountain. 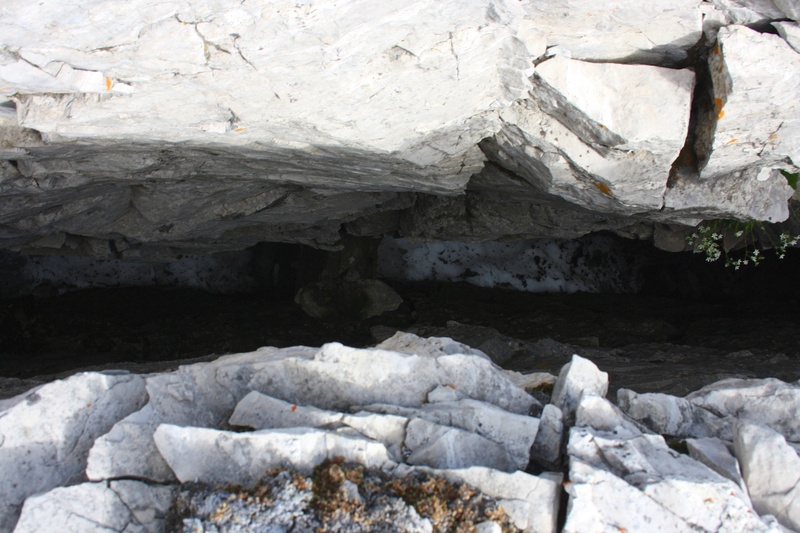 Even though it was August, this deep fissure was filled with snow. This would be something to be mindful of during a winter ascent of Turtle, as these potential hazards could be covered by snow.